HUTCHINSON, Kan. – The No. 8 Seward County volleyball team (13-2, 5-0) continued their hot streak, sweeping both opponents to open the Blue Dragon Volleyball Invitational. The Lady Saints defeated Jefferson College 3-0 (25-22, 25-16, 25-17) before sweeping No. 14 Mineral Area (25-16, 25-17, 25-23). It was a battle to begin the first set, as the Lady Saints trailed by one point through the first nine points. Back-to-back Jefferson attacking errors started a 6-0 run for the Lady Saints as they took a 10-5 lead. The Viking cut the lead to two points just a few points later, but a Giovanna Tapigliani kill, followed by a Nathiellen Machado ace started a 4-1 run as the Lady Saints took a 16-11 lead midway through the set. Despite the momentum, the Vikings fought their way back into the set, rattling off four-straight to cut the lead to one. Another 4-0 by the Lady Saints was all the distance needed as they won 25-22. The Lady Saints jumped out to a 7-3 lead early in the second set after the Vikings had trouble with a couple Machado serves. After increasing their lead to six points, Jefferson went on a 7-0 run to take a 12-11 lead before Djuly Schmorantz ended the run with a kill. From there it was all Seward County, winning 14 of the final 18 points in the set to win 25-16. The third set turned into a battle as the Vikings did their all to prevent being swept. The teams traded blows for the first until the score was tied at 11. Seward gained a manageable lead after going on a 5-0 run, forcing a Vikings timeout. The Lady Saints continued their attack coming out of the timeout, pushing their lead to eight points as they won set three 25-17. Seward was led on offense by Djuly Schmorantz, who came away with 12 kills. Giovanna Tapigliani came away with 10 kills in the match. Laura De Pra paced the match with 38 assists. De Pra also led the Lady Saints with seven digs. Playing their second straight match, Seward used their momentum and took advantage of a Cardinal squad that took some time finding their groove, taking a 6-3 early lead thanks to three Cardinal mistakes. Mineral Area managed to cut the lead to just one-point midway through the set with the score sitting at 12-11, but the Lady Saints responded by rattling off a 5-0 run capped by a Luz Sierra and Laura De Pra block. The Lady Saints continued to extend their lead, eventually winning off a Mineral Area serving error, 25-16. After Seward took 5-2 lead to begin the second set, the Cardinals began to find their stride, taking a 6-5 lead before Sierra ended the run with back-to-back kills. Through the first 10 Seward points, Sierra was responsible for four of them. Holding an 10-8 lead, the Lady Saints orchestrated an 8-2 run to extend their lead to eight points. That’s where the lead would stay with the Lady Saints winning 25-17. The Cardinals came out tough at the net in the third set, coming away with back-to-back blocks to put Mineral Area up 4-1 before the Lady Saints had to call a timeout to regroup. Trailing 6-4, a questionable net call on Tavares pushed the Cardinal lead back to three, before an attacking error gave Seward their largest deficit of the match at 8-4. The Lady Saints cut the Cardinal lead to one point on four occasions before they were able to tie the set at 11 with back-to-back Schmorantz kills. 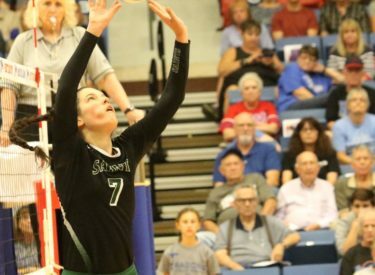 Though they tied the set, Seward struggled to overtake the Cardinals, trading points with the 14th ranked team until Mineral Area took went on a 3-0 run to take an 18-15 lead and force a Seward timeout. The timeout slowed down the Cardinals enough for the Lady Saints to tie the set at 20 before Mineral Area was charged with a ball handling error to give Seward a 21-20 lead. The Cardinals tied it at 23, but a Schmorantz kill followed by a Sierra block was enough to end the set, giving Seward the 25-23 win and their second sweep of the day. It was an all-time great performance by the Lady Saints, coming away with 50 team kills – the third most kills in a three-set match. Four Lady Saints reached double-digit kills – Luz Sierra (13), Djuly Schmorantz (12), Giovanna Tapigliani (11) and Esmadar Tavares (10). The kills came on the passes of Laura De Pra, who broke yet another record, as she finished with 50 assists – the highest assist total in a three-set match. Seward will finish the weekend against two more ranked opponent tomorrow when they take on No. 2 Iowa Western at 11 am and No. 17 Missouri State West Plains at 3 pm.